Professor Chris Brink served as Vice-Chancellor of Newcastle University in the United Kingdom for 10 years and before that as Rector and Vice-Chancellor of Stellenbosch University for 5 years. He retired in 2016, and returned to South Africa. As Rector of Stellenbosch University, he led a transformation agenda that combined teaching quality, social diversity, and promotion of research. He also initiated, with the city’s Mayor, a town-and-gown collaboration called ‘Reinventing Stellenbosch’, aimed at overcoming the divisions of the apartheid era. Bringing the same vision and values to Newcastle, Professor Brink championed the vision of a world-class civic university, ensuring that the institution’s research and teaching focused on tackling some of the major challenges facing global society. He is known for crystallising the idea of a civic university into two key questions: What are we good at and what are we good for. Prof Brink was a Board member of the Russell Group, the association of top universities in the UK, as well as the N8, the partnership of eight research-intensive universities in the North of England, which he also chaired. 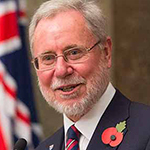 He has served as a Board member of Universities UK, the national Equality Challenge Unit, the national Quality Assurance Agency, and the Advisory Committee on Leadership, Governance and Management of the HE Funding Council for England, the North East Local Enterprise Partnership, and various regional Boards. He currently serves on the University Grants Committee in Hong Kong, and as a ‘Critical Reader’ for the Department of Science and Technology in South Africa. Before going to Stellenbosch Professor Brink served as Pro-Vice-Chancellor (Research) at the University of Wollongong in Australia. Before that, he was Professor and Head of the Department of Mathematics and Applied Mathematics at the University of Cape Town, and served as the University’s Coordinator of Strategic Planning. During the 1980s, he also held appointment as a Senior Research Fellow at the Australian National University. Chris Brink is a logician with a Cambridge PhD and an interdisciplinary DPhil. He holds Master’s degrees from Rhodes University in both philosophy and mathematics, and a Bachelor’s degree in computer science. His research areas include mathematics, logic, philosophy and computer science, and he has published in all these fields. Before moving into management he held the prestigious ‘A’-rating of the National Research Foundation, which ranked him as one of South Africa’s leading scientists. He is a Fellow of the Royal Society of South Africa and holds the Freedom of the City of Newcastle. He has been awarded an Honorary Doctorate in Civil Law.